Please fill out the form and we will be in contact shortly. I'm between 18 & 65 years old. This information will not be shared with anyone except NOCD, Blaze Clinical, and the nearest participating research site. Your information was sent to NOCD, Blaze Clinical, and the nearest research site. A representative will contact you shortly. 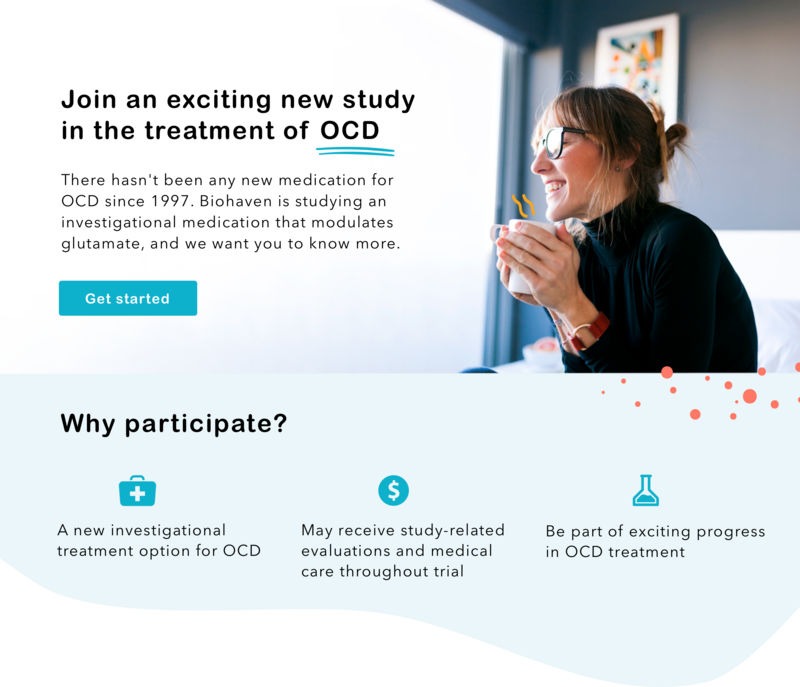 To join this study, you must have OCD and be between 18-65 years old. We've received your submission to the pre-screening form for Biohaven's ongoing clinical trial of the investigational medication BHV-4157. There are currently no active sites close to your location. The trial will require you to visit the site multiple times over the course of a few months, so we have not forwarded your information at this time. A closer site might open at a later time. If so, we will automatically send the information from your pre-screening form to that site and they will contact you. However, if you're willing to travel farther and don't want to wait, you can call one of the sites on this list. Biohaven Pharmaceuticals in New Haven, Connecticut, is the sponsor of the study. Biohaven researches a range of neurological disorders, and obsessive-compulsive disorder is an important focus of their work.